If you and your buddies are already chatting with one another via Kik Messenger, then you might as well surf the web together, too. Kik Interactive is embedding a web browser into its native iOS and Android apps. Kik’s growing community of users no longer has to paste links into text fields if they want to share a webpage, and those links no longer have to opened in a separate browser. Instead, they can just go to any website and instantly share it with friends at the other of end of a chat session. With the next release of its apps, users will notice new URL and search bars at the top of their screens, which can be used to enter an address directly or access Kik’s search engine. Don’t expect a Google(s goog) or Bing(s msft) search window to pop up, though. Kik is pushing its own content and content partnerships to the forefront of search results. 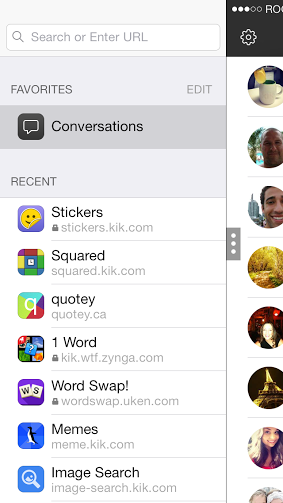 It also doesn’t look like Kik is tapping into the Safari (s aapl) or Android browsers native to the phones. Instead, Kik said its custom browser would render pages slightly differently. It’s offering a toolkit to web developers that will let them optimize the look of their sites as well as plug their HTML5 apps directly into the Kik browser. Kik is one of dozens of mid-sized over-the-top messaging providers, trying to break into the rarified realm of OTT communications leaders Skype(s msft), Facebook(s fb), WhatsApp, Line, WeChat and Viber. And recently Kik has shown signs of making that leap. It surpassed the 100 million registered user mark in December, and while many OTT players are seeing their growth overseas, Kik claims its success is coming right here in the U.S. Instead of focusing solely on messaging, Kik is trying to become a social content platform. Last year it launched a feature called Cards, which inserts HTML5 apps such as YouTube video sharing and social games directly into the Kik platform. The introduction of the browser expands upon that concept. Instead of relying on developers to build special HTML5 apps specifically for Kik, the browser lets users tap the rich HTML5 content already on their websites.